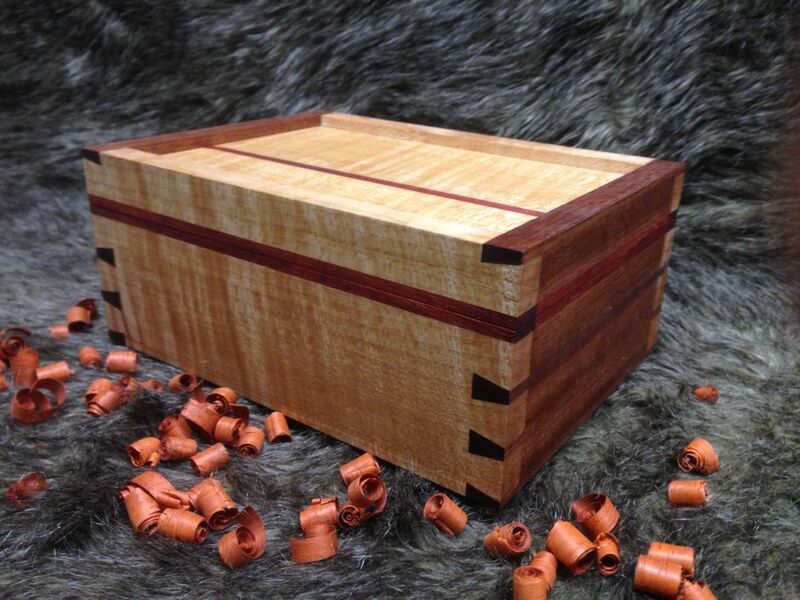 I had been woodworking mostly vicariously through different Youtubers for the better part of a year. 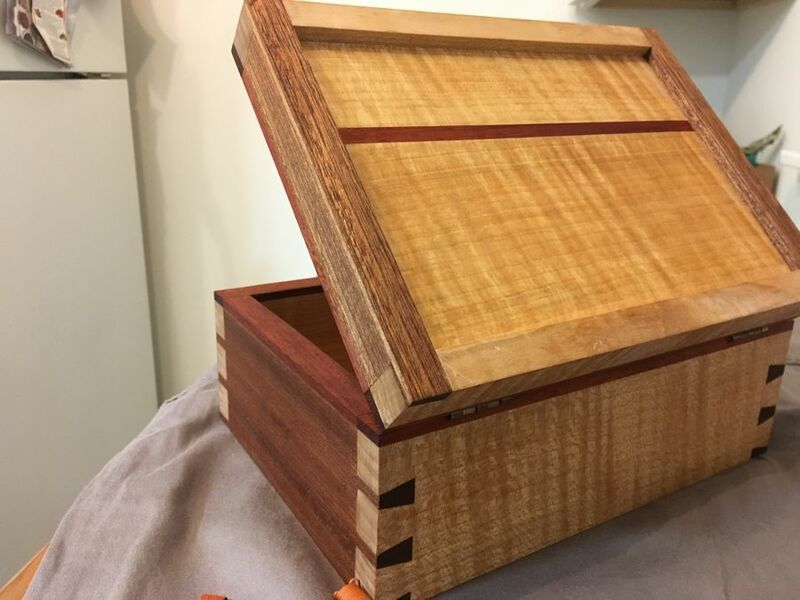 I've never really had the funds while in college to buy tools and fancy woods, so what I have built I've built with cheap or free woods with the best craigslist tools I could find. 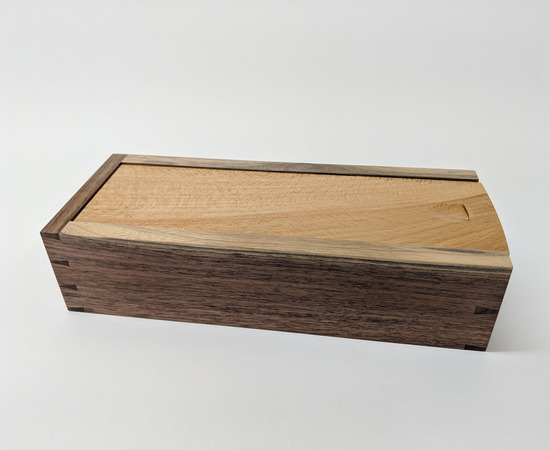 So when taxes rolled in I seized the opportunity and splurged on some nicer woods, some curly Maple, Sapele, and Paduak, I had been planning on making another box for a friends birthday, but with the week of Finals going on I would only have less than a week to finish the gift. 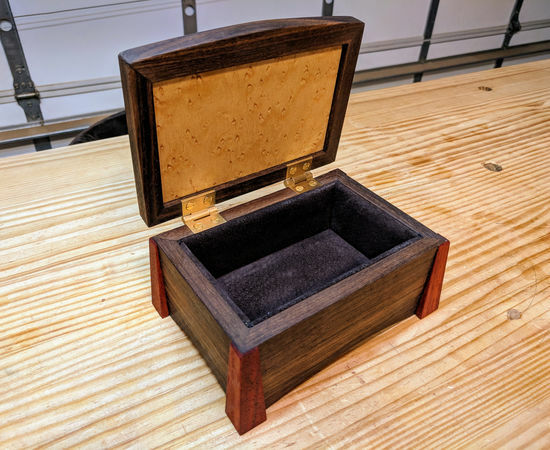 I didn't plan out this box at all before I started building it. 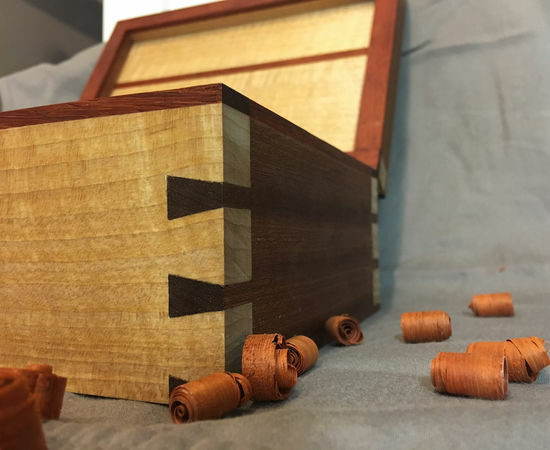 I knew there was the dovetail challenge going on via Reddit, and I knew I wanted to create something that I felt could compete with the amazing content that I see on the site. 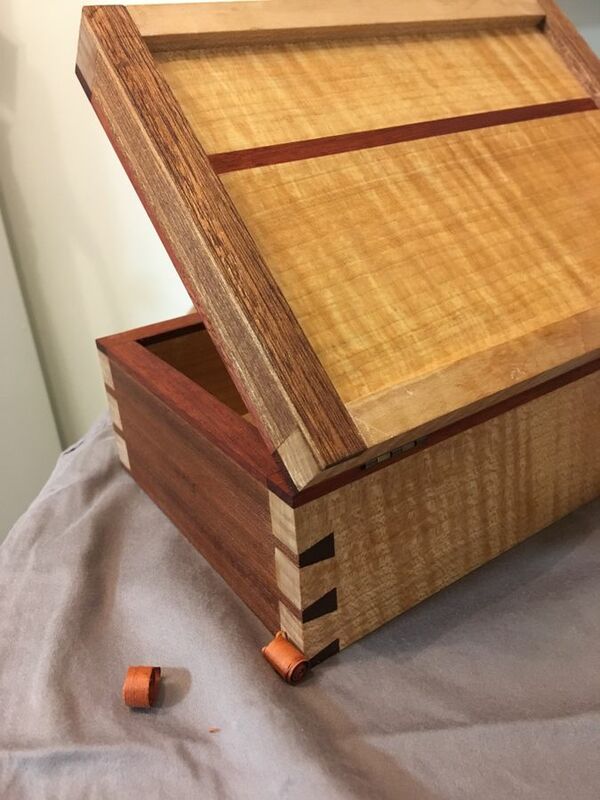 I also knew I wanted to maple sapele paduak (none of my woods make the pun, should have used spruce instead) up the dovetails, and decided that bisecting one would be my creative addition to the piece. 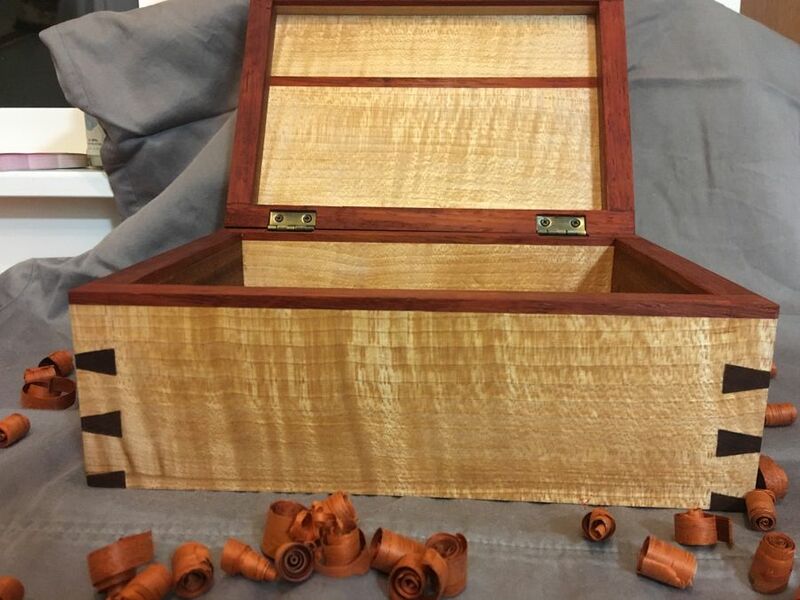 This was the first time I was using many techniques I had seen my inspirations use as well as a table saw, so trying to plan out how to account for saw kerf and such was problematic. I am so happy with the final result. 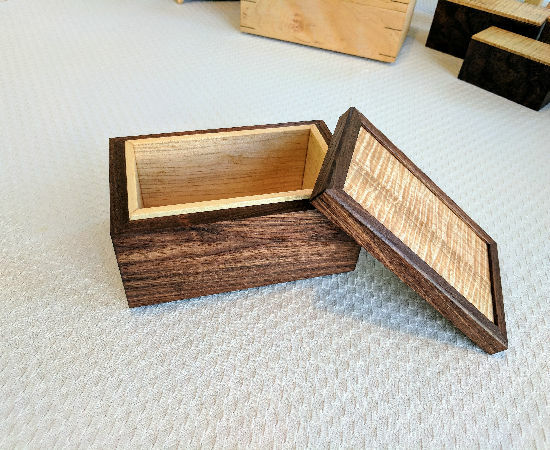 I am not the best with photography, but I hope that these pictures still do the box justice. Total time was probably around twenty hours over 4 days. 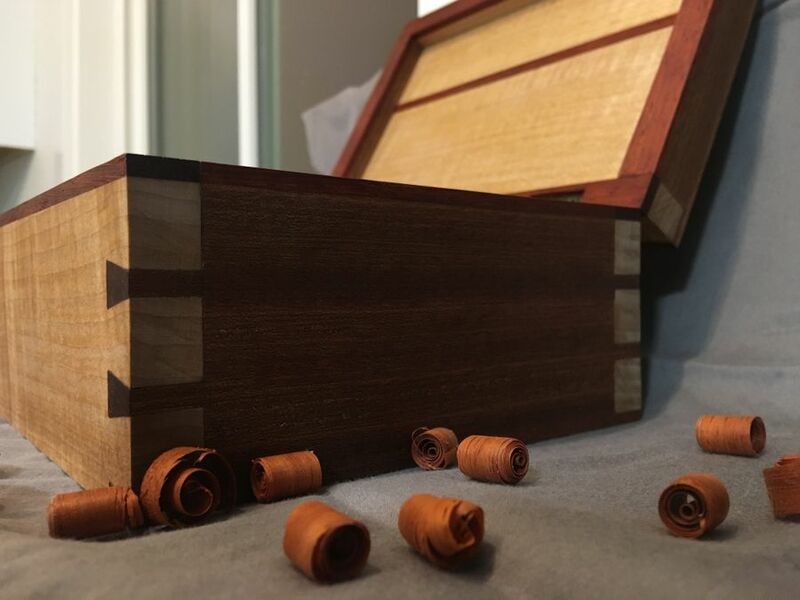 I learned so much doing this project, and feel like I achieved my goal of creating something that could compete with some of the creations I see from the r/woodworking community. Id be happy to answer any questions you all have, and would love to hear any sort of constructive criticism you all have. I want to be better. 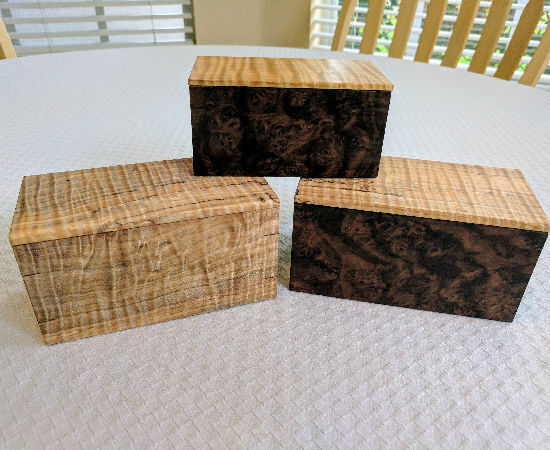 I picked up these woods from the local place that sells it! 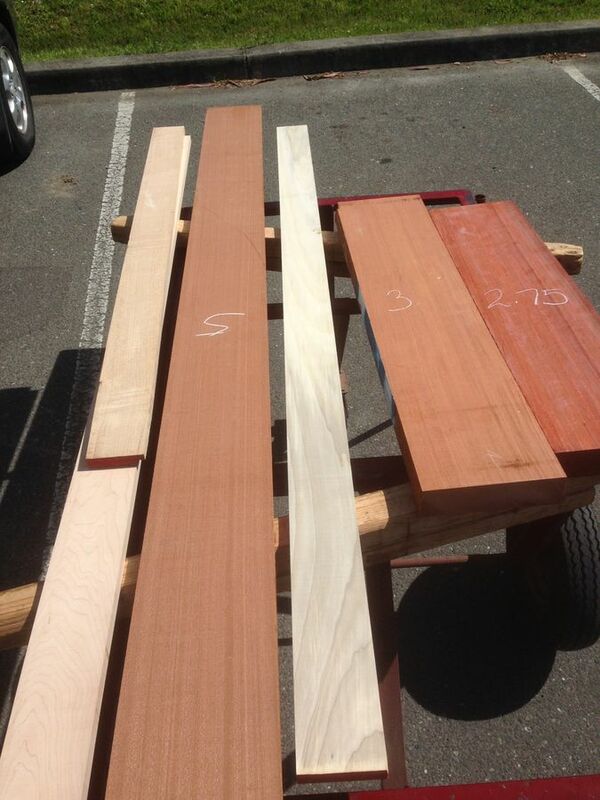 I spent probably two hours trying to figure out what type of woods to buy but settled on Maple, Sapele, and Paduak (also some poplar for reasons). 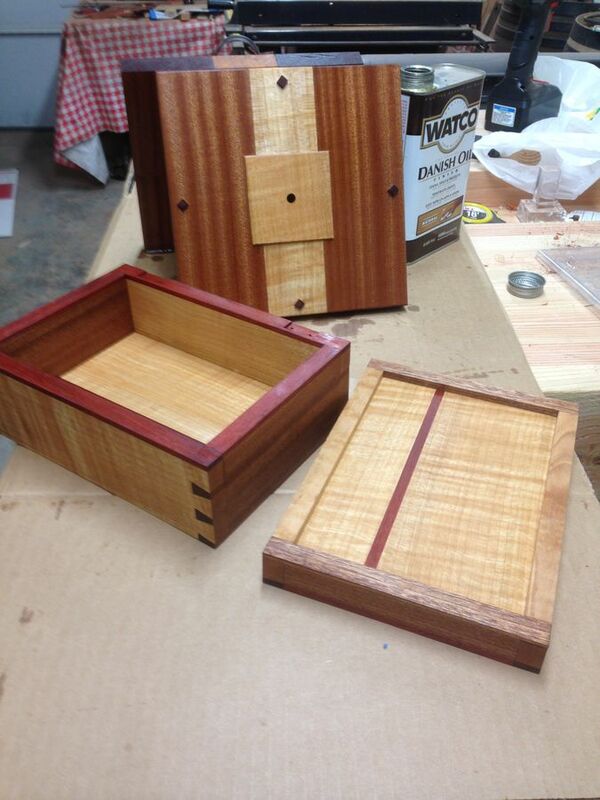 First time jsing a table saw to mill things, but I feel like these came out well. 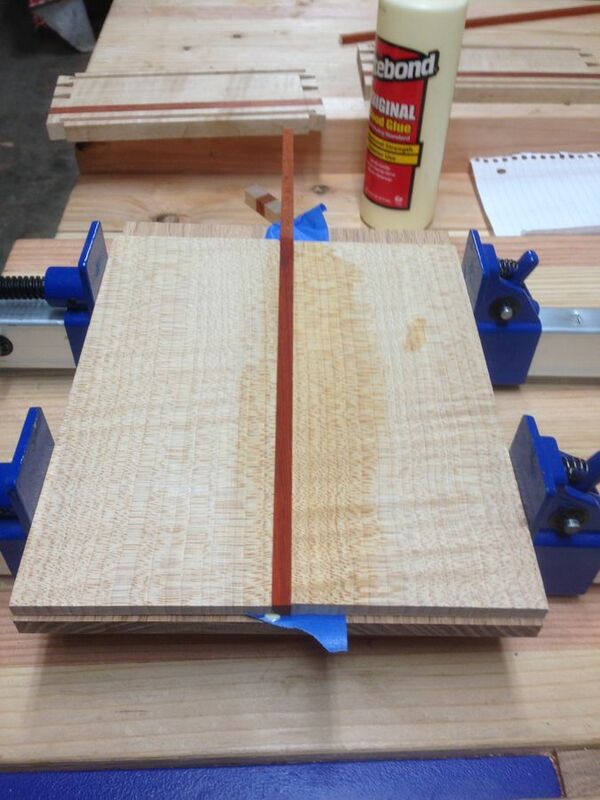 The glue up was straight forward. 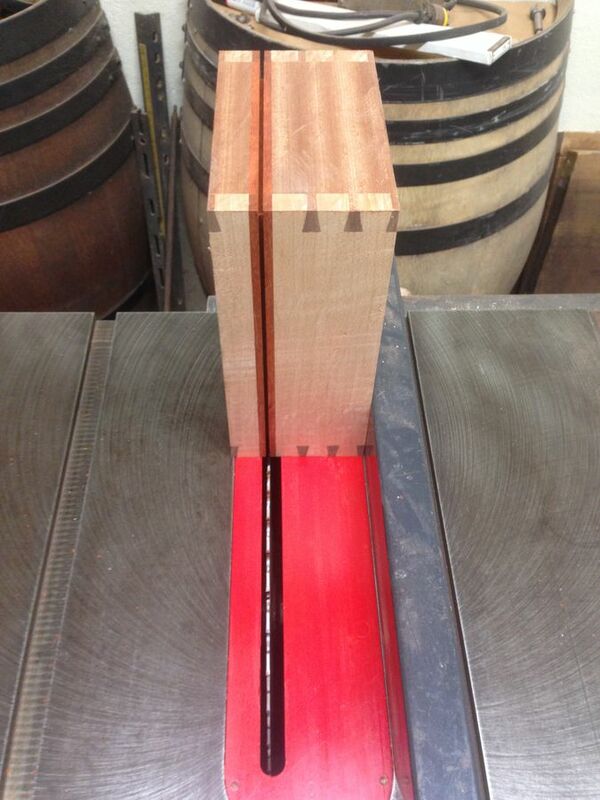 Cutting the dovetails. 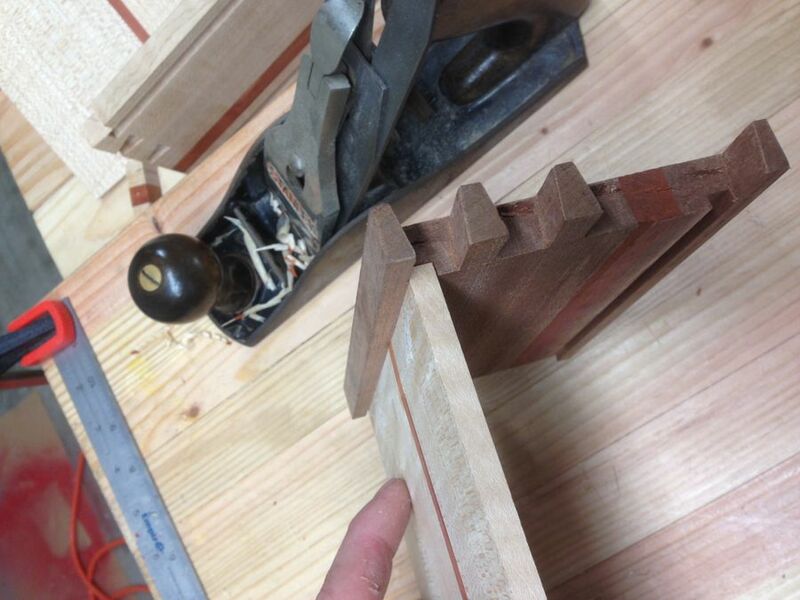 If you are scared of Dovetails, give the Kats-Moses jig a try. These are my 12th-15th attempts ever doing them, and first set with his jig. Very pleased with how they turned out. This is what happens when you don't properly mark your waste and are in a rush trying to get the project done. 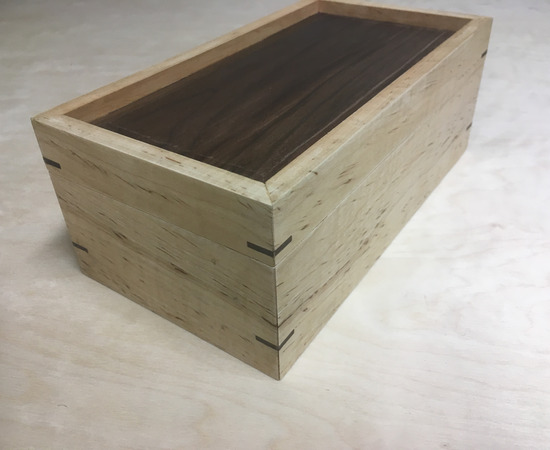 Coping saw error caused me to make my box a little thinner. Roommate came down to see the commotion. 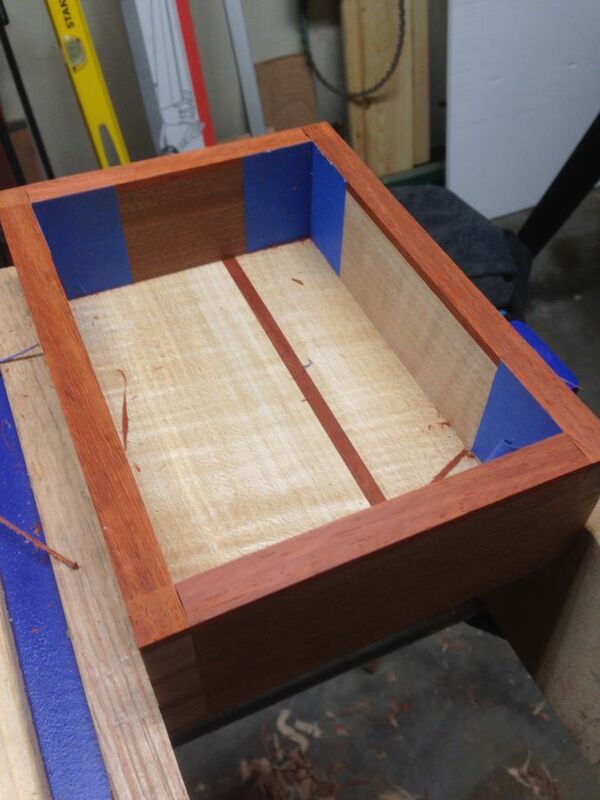 One of the joints dry fitted, At this point I am in love with the project. So clean! 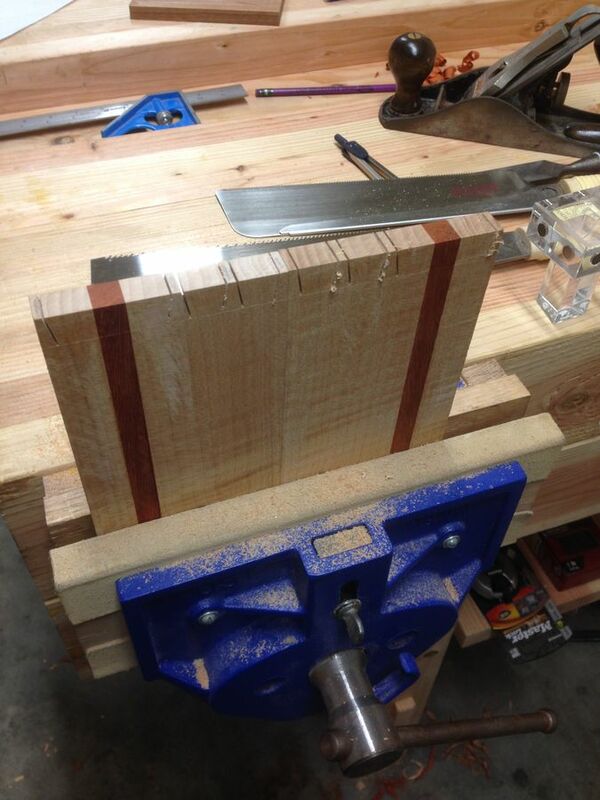 First time doing plunge cuts on a table saw. 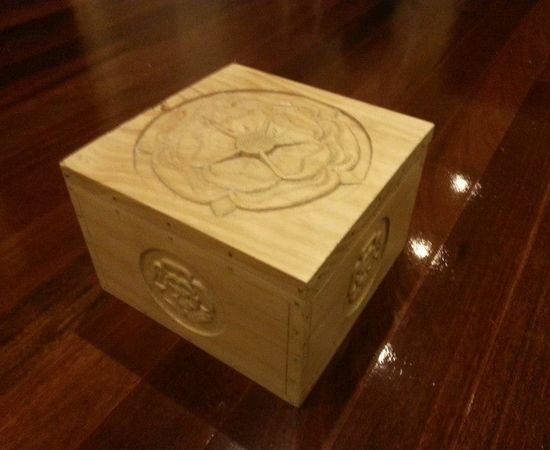 A bit terrifying, but came out well with barely any chisel cleanup needed. 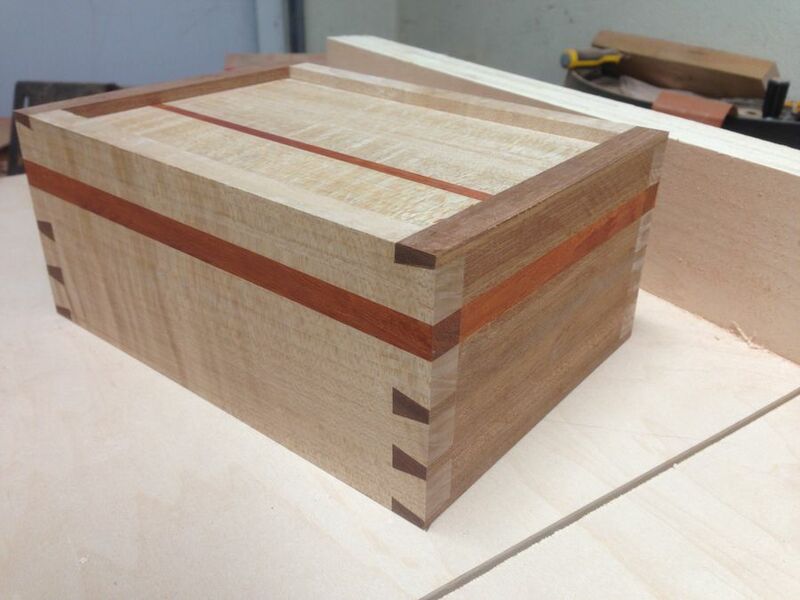 Decided to go for an accented solid piece for the top and bottom. 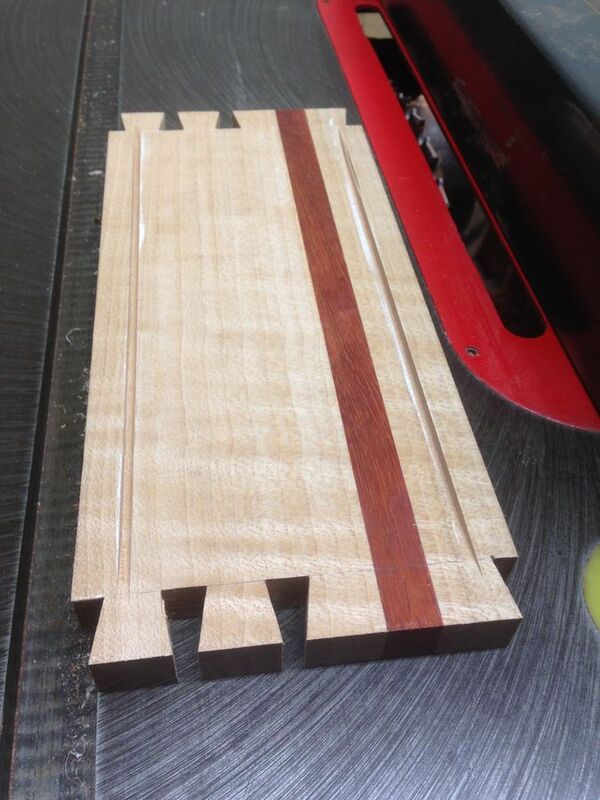 Had to put the project on hold while decided whether or not to keep the Paduak line in the middle or offset it a bit. Glad I chose the offset in the end. 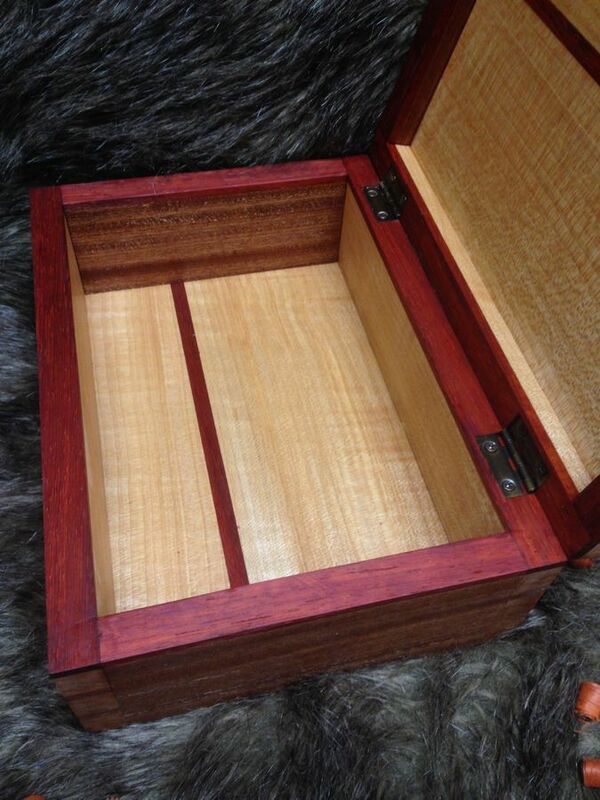 Put a very shallow chamfer on the edges of the top an bottom so it would fit snugly in the sides. I think I left enough room for wood movement? I know it shows as no gap here, but assembled there seems to be enough. 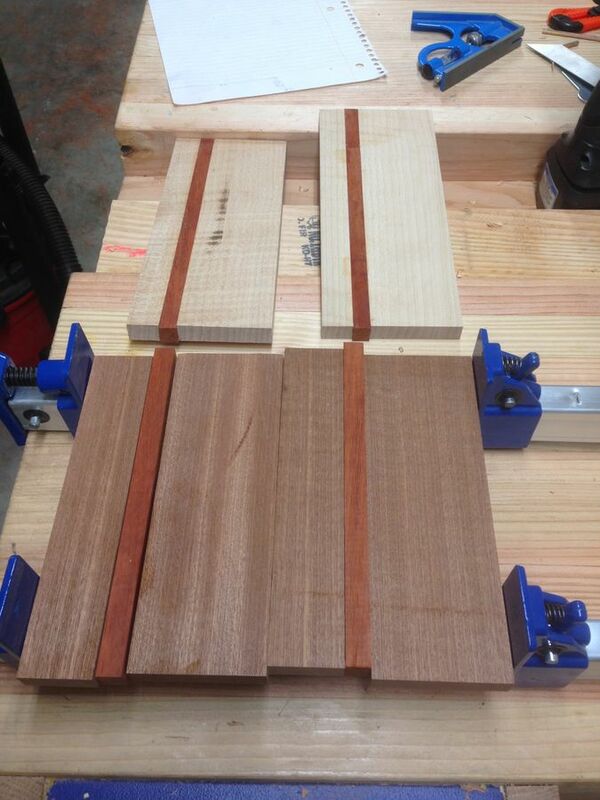 The glue up. 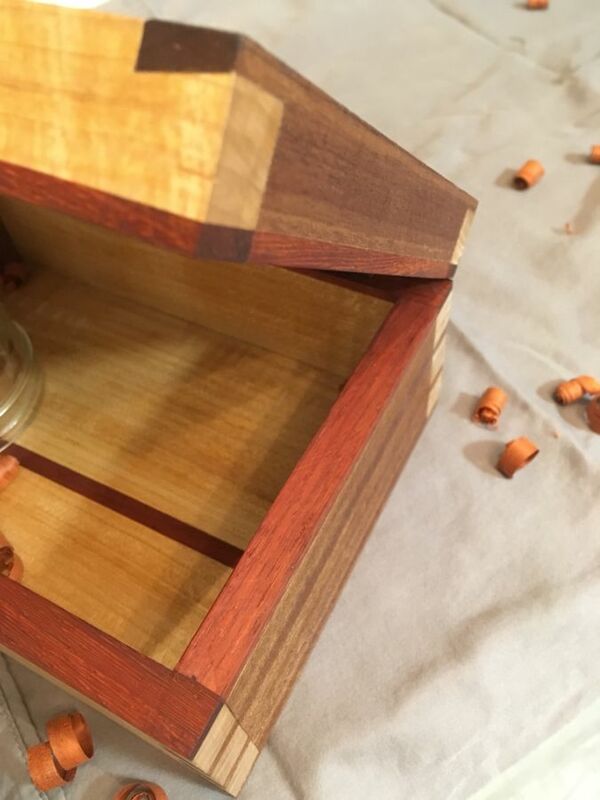 I did tape the inside corners to make the cleanup easier. 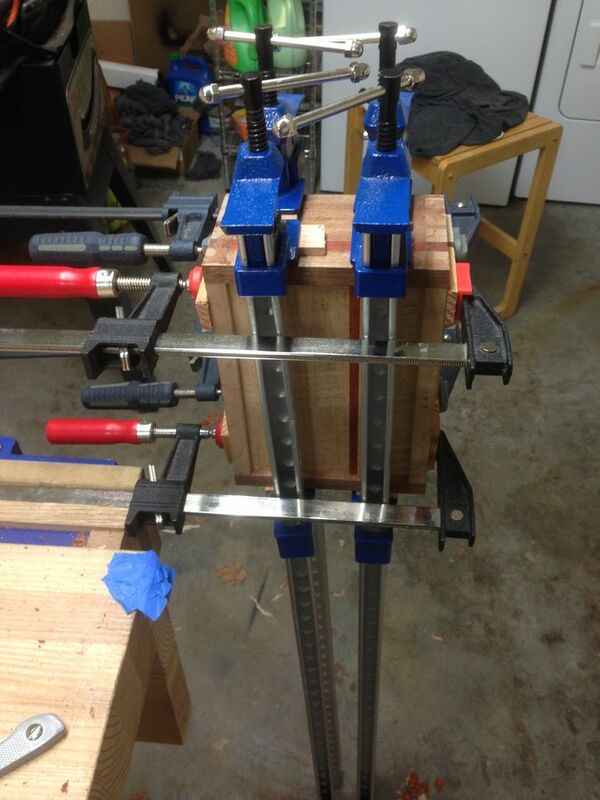 I also wish I had more clamps. 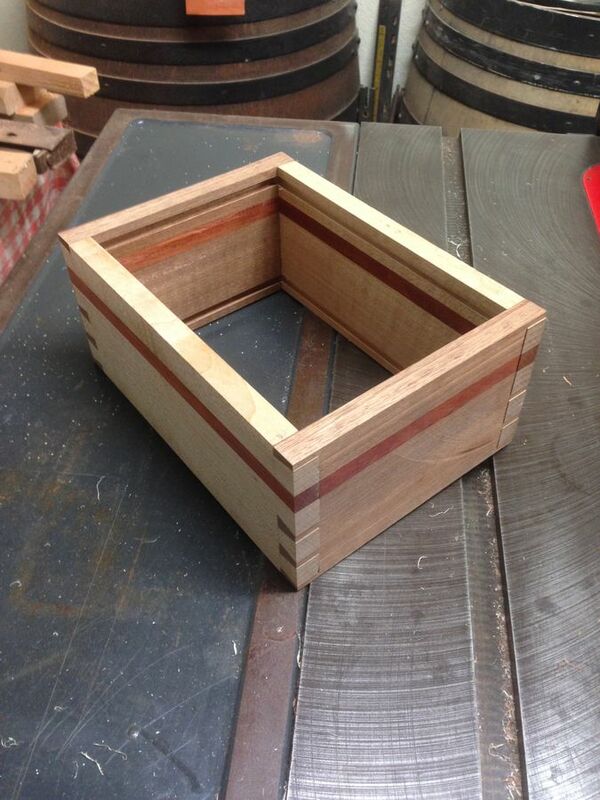 Here it is post glue up, right before I separated the lid. This was absolutely terrifying. Cut like 99% of the way through, finished with my knife. 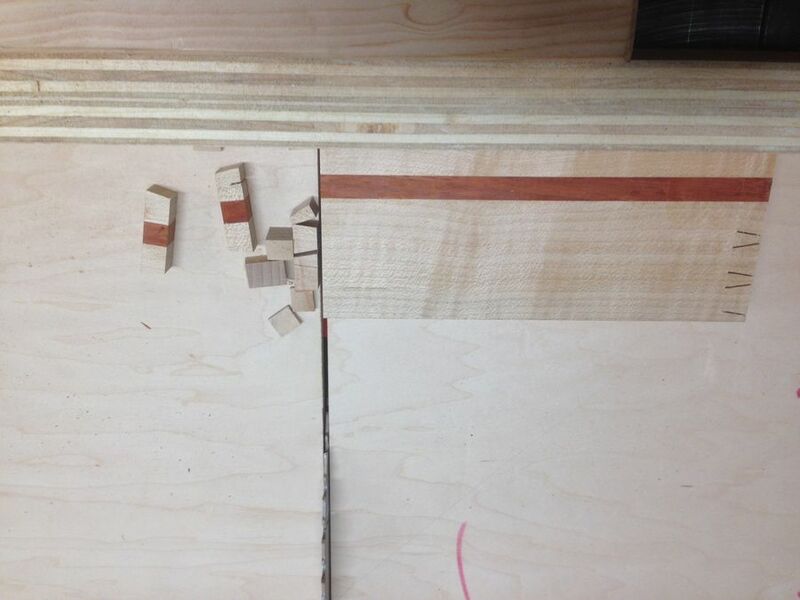 I think that my most hated part of this project was cutting the recesses for the hinges. I just don;t know how to plan for them well enough. 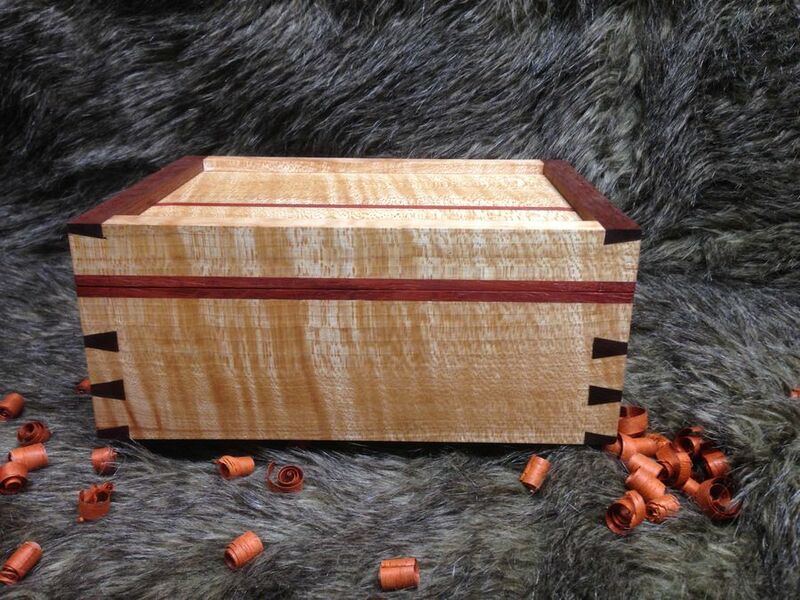 I winged this and had a very frustrating time drilling and screwing in the hinges. Here it is at the end. I'm not the most fancy photographer, but you get the point. 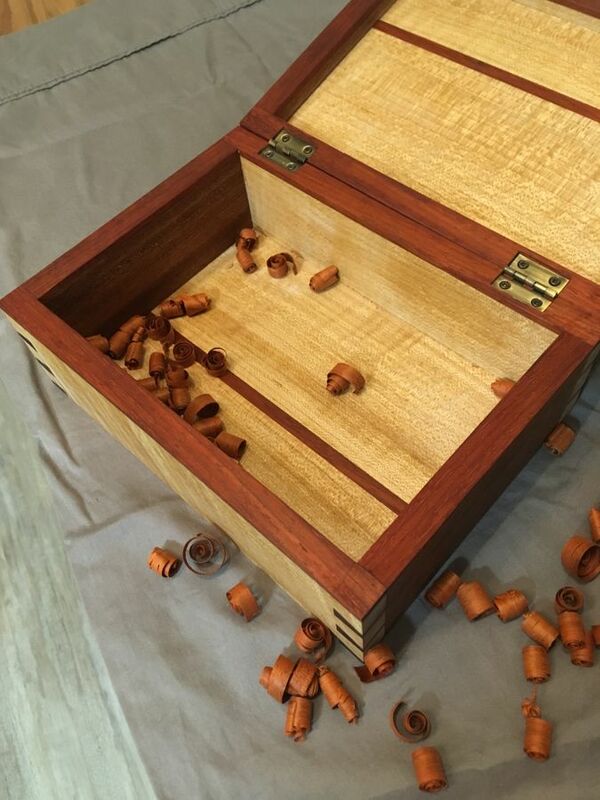 Finished with a coat of danish oil, ill probably add another sometime soon. 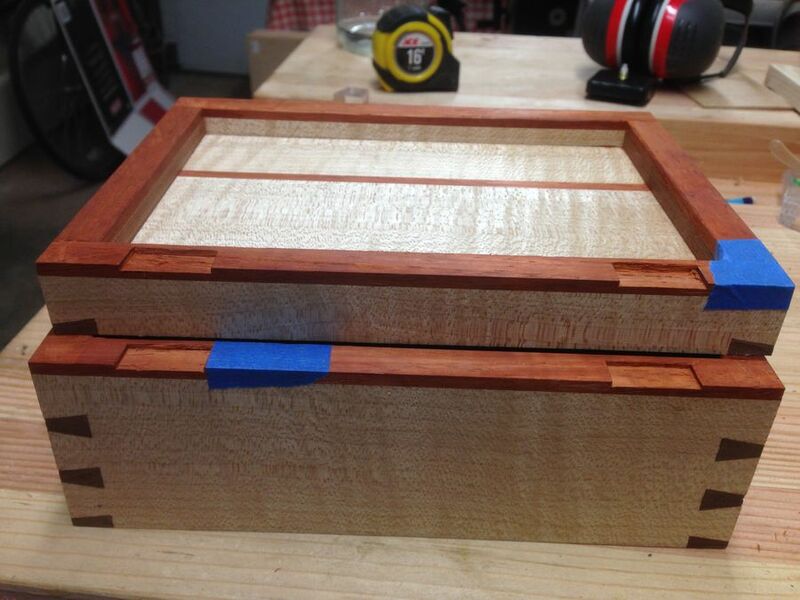 Hinges came out alright. 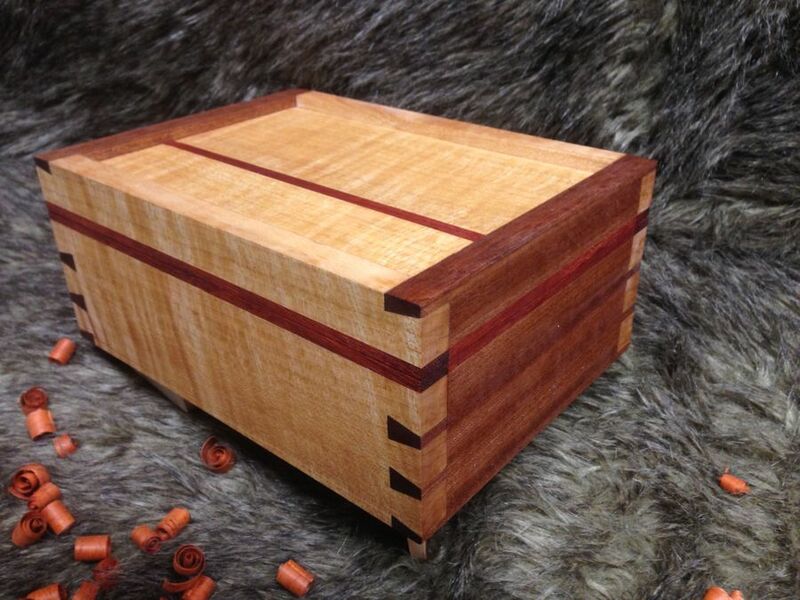 Love how the Paduak line bisects the Dovetail. 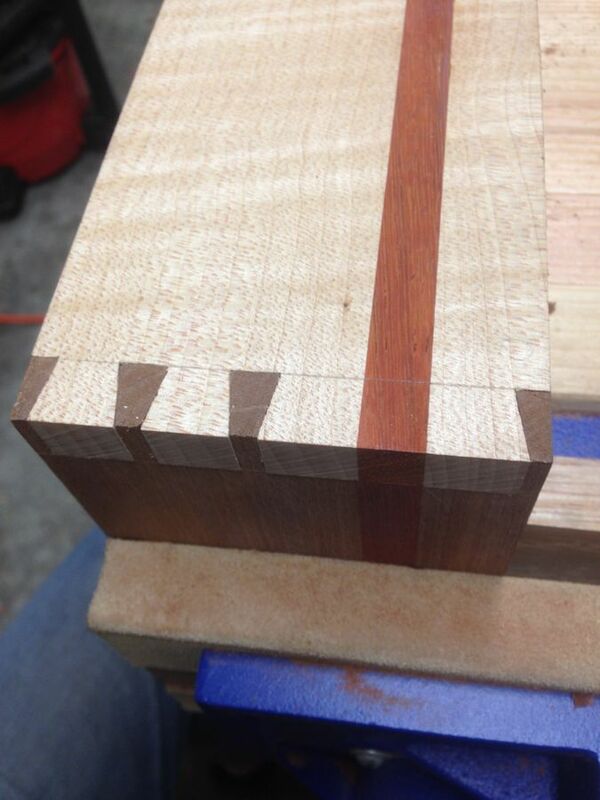 I dont know how, but somehow the Sapele grain lined up perfectly with the pins, making lines through the piece. Any constructive criticism would be appreciated! Thanks! Oh I also was making a pair of matching wall clocks while this project was going on. They ended up getting the finest of cheap amazon clock hardware. 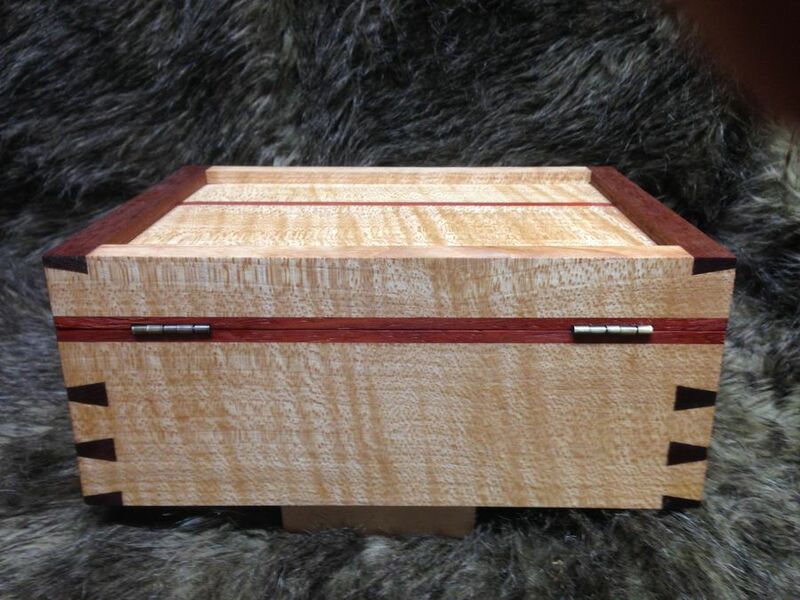 Love how the Paduak line bisects the Dovetail. 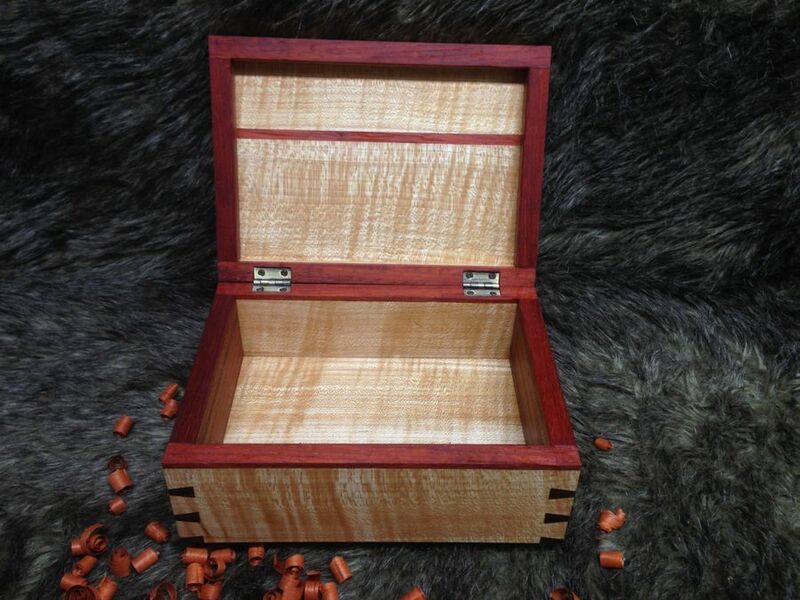 Beautiful box! 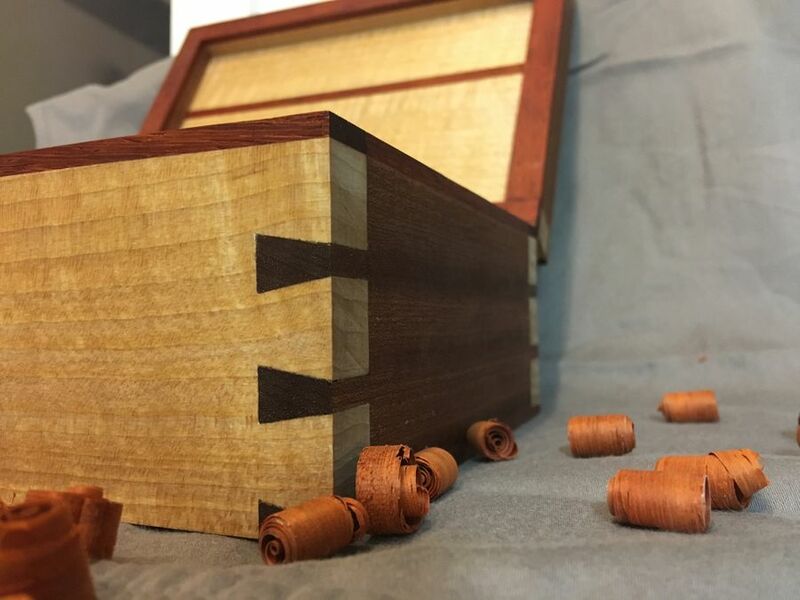 You did a fantastic job, especially on the dovetails! 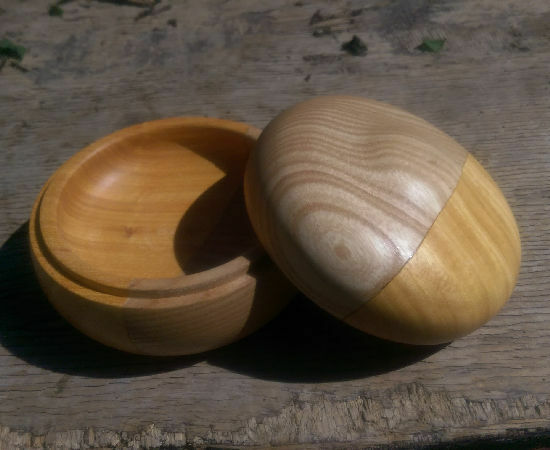 You have a good eye for nice wood combinations too. Thank you for sharing here on SimpleCove. I hope to see more of your work. There doesn't seem to be anything to criticize here. The design and execution seem to be right on point. Great job! 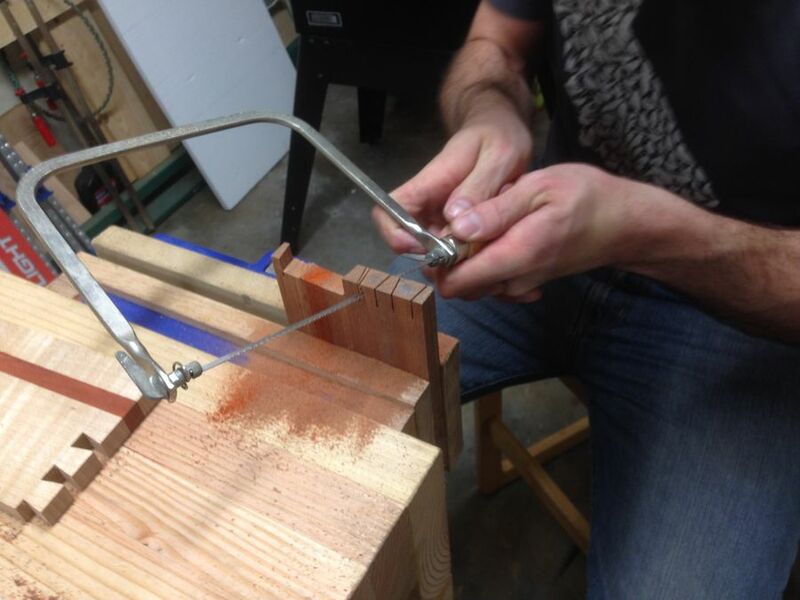 Hinges and hinge mortises, like everything in woodworking, get easier with practice. I do find that higher end hardware can make a real difference.